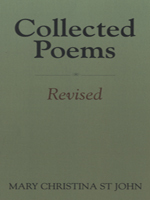 Mary Christina St John has sifted through her lifetime's work to produce a volume containing all those poems she is still wedded to, even if, as she says in the preface, their sentiments may by now be foreign to her. Chronologically ordered, the book is divided into Juvenilia , Love Poems , Occasional and Sundry Other Poems and Sacred Poems . Writing with meaningfulness and clarity, Mary Christina St John believes in straight talking, even to God. But although it is as a religious poet that she will be remembered, her earlier love poems have equal merit and deserve a place in this celebration of her life's work.